Cause we’re already in Dago area, after having our breakfast, we went to Kartika Sari Dago. I haven’t been there for a while and I was amazed with their new look. Beside the Kartika Sari, there’s also cafe and even Factory Outlets in the second floor. They also have some cozy meeting rooms. One more thing, they even build a basement for the parking area. Wow...really a nice place! Next destination is still to look for Bandung’s fave food, so we went to Kue Bawean in Jalan Riau and Gepuk Ny. Yong. Gepuk Ny Yong is quite expensive now, it cost Rp 8,000 for one piece of Gepuk. You may choose to buy the original or the spicy one. Already in Riau area, we move on to Primarasa on Jalan Kemuning. Some of the team were shopping there and some were having a photo session at Bestcare, the baby shop right in front of Primarasa. Enough in Riau area, we move on to Batagor Kingsley on Jalan Veteran, too bad we didn’t take any picture there. We ordered some batagor and siomay, and also bought batagor to be taken away. After batagor, we went to Rasa ice cream and bakery, to try what I told them “the best ice cream in Bandung” Because everyone was full, we only bought one single scoop and they agree that the ice cream was delicious. Finally it was time to have lunch and we went to blackpepper in Jalan Maulana Yusuf. Although everyone was really full after a half day dining experience, still each person ordered one portion of steak. After the great and heavy lunch, everyone was agree to visit some Factory Outlets before we try something else. We went to the Cascade, Heritage, The Summit and Stamp. But only myself who did the shopping for najmi and his cousin, while the rest thought that Mangga Dua is cheaper. Because I haven’t found anything for najmi’s cousin, so I asked everyone to company me to a factory outlet called “anak kecil” and finally I found something there. 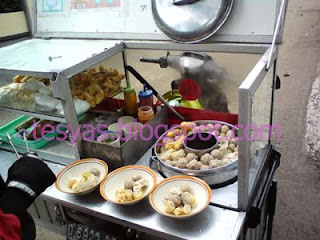 To close our dining experience session in Bandung that day, we went to eat Sop Buah Ewok near Gedung Sate Bandung. It was also the first time that I had the es buah ewok, and when I tried it, I really regret why I haven’t tried this delicious food until now? The fruit are fresh, mixed up one another giving it really fresh taste. Time flew really fast that day, and after the sop buah session, it’s time to go to the travel which will take them to Jakarta. Before we went to City Trans travel, we bought baso tahu lavie on Jalan Imam Bonjol, and there we met Samuel and Audrey who picked up Yuni. Before saying goodbye, we took one last picture.. Hope that everyone will keep the Bandung’s memory in their heart like I do. I often spend my weekend in Bandung, but this special weekend I’d like to write here is the weekend I spent with my beloved team; Lusi, Mely, Sisca, Yuli, Yuni, and Yenni. We left our office Friday afternoon, then we go directly to Bandung. Thanks God the traffic was really fine that we could arrive around 8 pm in Bandung. We went directly to PVJ to have dinner at Zuki Suki, but we had to wait because the resto was full. So we decided to have a cup of ice cream from Gelato Bar first. Then we were walking down the shops in PVJ when I got a call from zuki suki informing that our table is ready. Yippiieee we were so hungry.. The dinner was to celebrate my bday which has already past one month hehe... everyone loves the food. After the zuki suki experience, we went to my home, except Yuni who was picked up by her husband and was going to join the team again tomorrow morning. Bye PVJ, we’re going to visit you soon.. The next morning, everyone woke up early and by 7 AM , everyone is ready to leave my home. I had to leave najmi with my mother and Rene that Saturday. 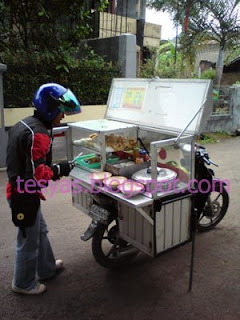 So sorry Najmi..
First destination was to have a chicken porridge at Mang Oyo on Jalan Sulanjana Bandung. We arrived at 7.30 and the place was really crowded. We had to wait for a while to have our chicken porridge. 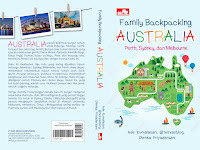 It was the first time for everyone except for Sisca and myself, but they all like it. Having read a review on Toko Coklat on one of architect magazine, we decided to visit this shop. As written in the magazine, the building is very unique, yet it is a very cozy place to hang out with your friends or your loved one. 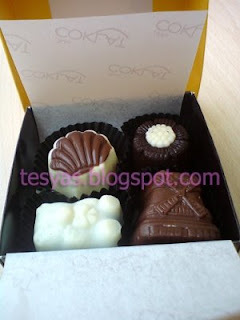 The chocolate was really good, even better than Dapur Coklat. The Ice Chocolate was ok, but the cake was lousy, or we choose the wrong variety of cake? 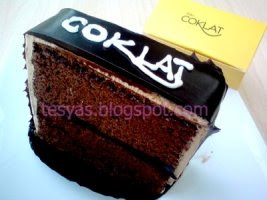 This Toko Coklat located on Jalan Progo, near Riau area. 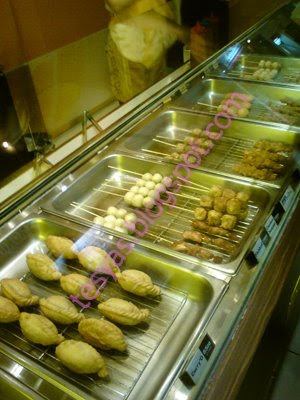 Next time you shop in the factory outlets in Riau area, make sure you also visit Toko Coklat. I guarantee that you’ll agree the chocolates are really special. 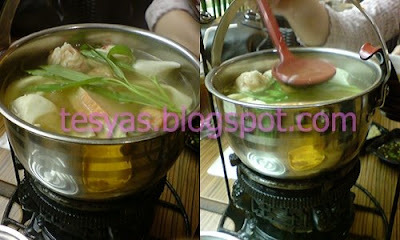 The first time I tried Ra Chaa, I had it both for lunch and dinner on the same day! I really really love it! It was an ordinary Friday when I and my team had to choose where to eat, and we decided to try Ra Chaa at Mall Kelapa Gading 3. When we got there, I had to go to Sonny Ericsson outlet first to have Rene’s phone repaired, so I didn’t join the food pick up and also the cooking session.. All was done by my friends, because the queue was quite long at SE outlet. And that's why after office hour ww went to Ra Chaa once again..
Ra Chaa is a both grilled and suki resto, first when you walk in to the resto, you have to choose what you’re going to have, each food are tagged with particular color represent different prices. You may choose suki or grilled only, but better to have them both. You also have to order rice and drinks, then pay to the cashier. No refill for the drinks..that’s too bad.. 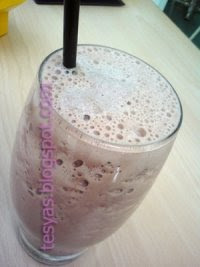 The drinks is around Rp 10,000 to Rp 13.500 vary form thai iced tea, ocha, iced coffee, lemon tea or just mineral water. For what I and Rene ordered that day, we had to pay Rp 50,000 per person, and we were so full... Tge price really depends on what kind of food you choose. I like the grilled meat better than the suki. So when we want to have some grilled yakiniku, we don’t have to go to Hanamasa anymore *it’s too expensive! * instead we can have it at Ra Chaa. 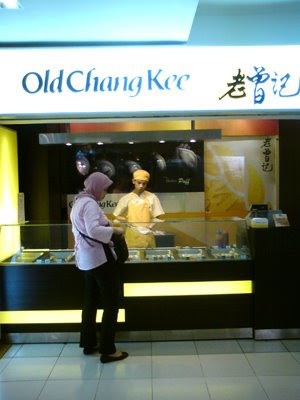 Now let’s talk about light snack from Singapore that now are available in Indonesia..Old Chang Kee at Mall Kelapa Gading. 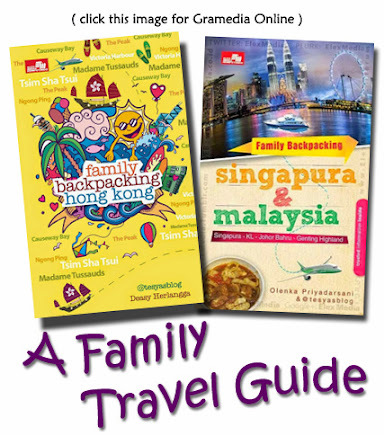 Actually you can also find it in Senayan City and E-X plaza as well, but as from those three malls MKG is the nearest mall from our office, so we often go there to buy Old Chang Kee. You can find fried foods from fish balls *this is our fave! 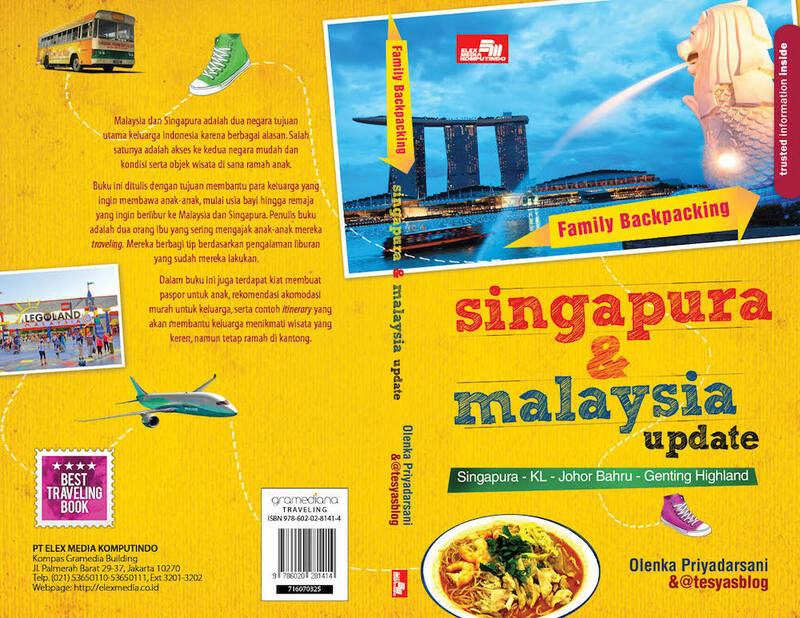 *, squid, curry puff, siomay, crab, in sticks which contains of three pieces. One stick cost from Rp 6,500 to Rp 8,000, same price with Old Chang Kee in Singapore. Don’t forget to add the sambal to your fried snacks. The sambal is really hot that made you want to add the snacks more and more. Bored with Gudeg or Soto while you’re in Yogyakarta? Try this place and I guarantee you’ll love it: Je Jamuran! 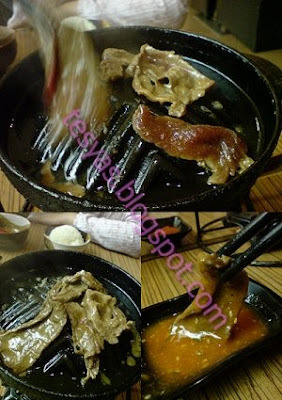 Jamur means mushroom, so this restaurant serves nothing but mushroom! They grew the mushroom by themselves as you may seen in the back of this restaurant. 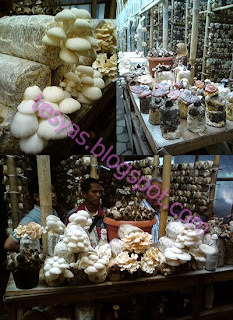 Not only they sell the cooked food but also varieties of the fresh mushroom. Located in Jalan Raya Magelang KM 10, if you’re heading to Borobudur from Yogyakarya through Jalan Raya Magelang, you will find the sign to this resto. 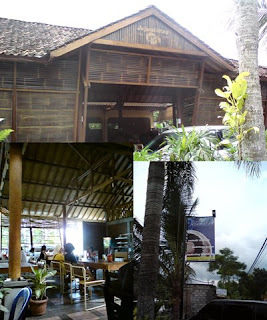 So from Yogya, you still have to turn right and after 800 meter, you’ll find this resto on your left. This resto is dominated with wood, so everyone will feel homey inside this resto. We had fried crispy mushroom, spicy mushroom bbq, mushroom satay and tongseng muashroom. I love the satay very much! It tastes like chicken believe it or not... the fired crispy mushroom was also soo crunchy, be careful with the spicy mushroom bbq, as it’ really hot!! I have never liked tongseng before, and I didn’t like the mushroom tongseng either. But however the taste is very unique! All of the food and drinks listed on the menu are very cheap! 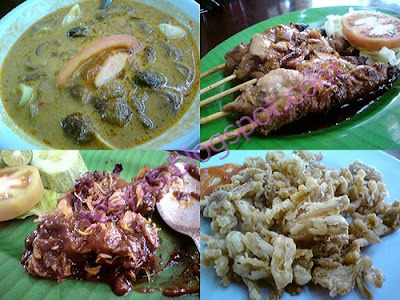 For 10 pieces of satay, we only have to pay Rp 8,000... all the food range from Rp 7,000 to Rp 15,000. Very cheap for such a healthy food! Two thumbs up for the owner of this place..for his idea..for the yummy food.. Heard that he’s a pension man and tried to open a business on his own. And when you come to this place and happened to meet the guy, you’ll agree with me that he looks very healthy and happy.. for sure he does his business with all of his passion! Hope when I pension someday, I will come up with a brilliant idea just like the owner of Je Jamuran. 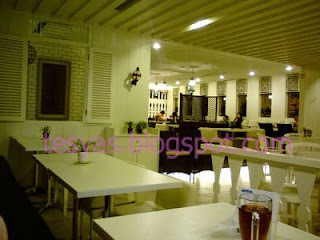 They try to design each branch with a betawi ambience. 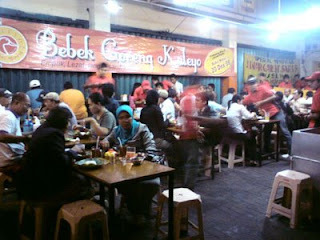 One of the example is the Kafe Betawi in Mall Kelapa Gading. The place is quite big and they have a very cozy sofa indeed..
On the menu, you may find so many betawi’s traditional food. Like kue rangi, asinan, otak-otak *is it palembang or betawi’s food by the way? * They look so delicious.. But we stick to the plan only to order soto betawi..while rene tried the nasi ulam. 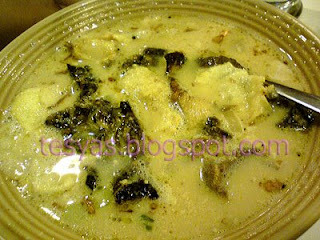 Mmmm the soto betawi was very yummy..don’t forget to add sambal and the jeruk purut to the soto! Beside meat it also contains paru and babat. The paru has been cooked first so it’s crunchy.. Don’t know what to say about the nasi ulam, because I didn’t want to try it. But rene said it was also delicious. We ordered a paket hemat menu, so for the soto betaw, rice and a glass of ice tea, it cost Rp 32,000, and the same for nasi ulam. Like I said before, quite expensive for such traditional food right? 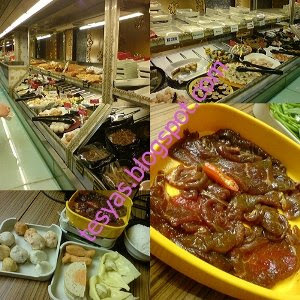 As a bebek lover, you really have to try this place..but don’t give up when you see the place is very crowded! Just park your car nearby and have a seat.. That was our experience when we wanna try this place. 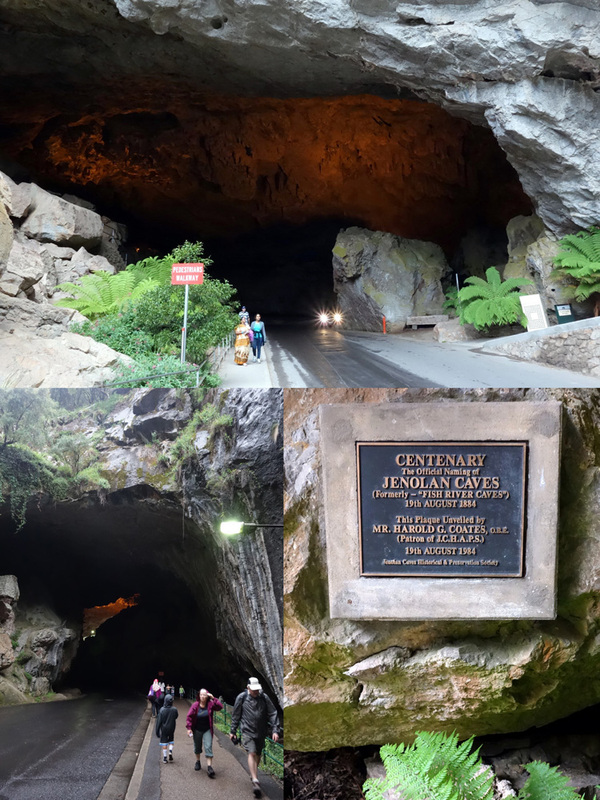 Heard this place from Pa Krisjna, and as this place is only 10 minutes away from my ofiice, we went there but decided to have something else cause the place was so crowded. The next time we went there, still it was very very crowded, but using my maternity power to rene *you know... things like: the baby wants to have bebek:p* we finally tried this place. Yup it was crowded but once you find the seat, you don’t wait that long. Actually the crowd was for the take away bebek. 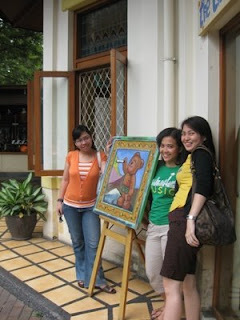 I had a bebek kremes while rene had a bebek cabe ijo. 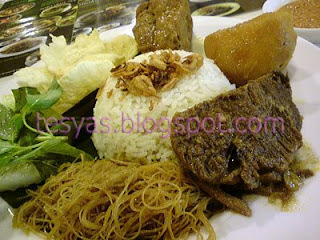 Served with rice, the sambal and fresh vegetable, it cost us only Rp 17,000/ portion. The bebek was quite big, chewy, and the sambal is very delicious! Especially for the bebek cabe ijo, it’s very hot!! Really not my food as I don’t like spice food that much. 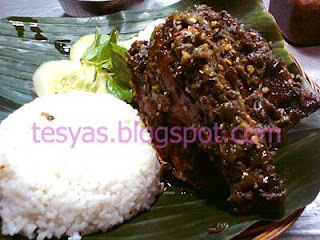 We’ve also tried the bebek bakar, but the taste of the bebek goreng kremes is much better. We still think that Bebek Goreng Suryo is still the best bebek in town though, but as the location is so far from our office, this bebek Kaleyo is just the right place for us to have bebek after office hours.